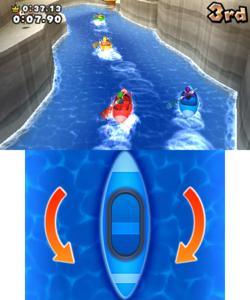 Paddle Skedaddle (Up the Creek in Europe and Australia) is a General mini-game in Mario Party: Island Tour. In the Demo, Blue Toad is seen demonstrating how to paddle left and right. The players race through a creek in canoes. The first portion of the race is a mountainous area. The second portion is a desert, while the third one is a grassland. The final portion is a beach-themed area, with a bridge which players jump onto after crossing the finish line. The first person to cross the finish line is the winner. Rules – NA "Race to the finish by paddling your canoe through the winding stream." Rules – PAL "Navigate the course in your canoe, and reach the finish line." This page was last edited on October 21, 2017, at 13:22.